JANUARY 18, 2019: EARLY BIRD DEADLINE – Schools that wish to receive feedback on the application should submit a strong, completed first draft of their application to the AIE Administrator via email (info@njaie.org). Applications received by this date will be reviewed by the AIE Administrator and the school will have the opportunity to update the application prior to the February 8th deadline. FEBRUARY 8, 2019: FINAL GRANT APPLICATION DEADLINE – A complete application packet includes: ONE electronic copy of the complete online application emailed to the AIE Administrator via email (info@njaie.org) and ONE typed hard copy (with original signatures) and support materials mailed to the AIE Administrator (AIE Administrator, c/o NJ Arts Council, 33 West State Street, 4th Floor, Trenton, NJ 08608). Only complete applications postmarked by this date will be forwarded to the panel for review. Schools that score in the upper tier of the panel review may be contacted for an interview prior to the final decision. Schools are notified of the panel’s decision at the end of May. 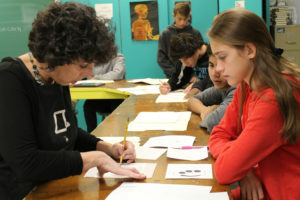 The Artists in Education Program is a project of the New Jersey State Council on the Arts and Young Audiences New Jersey & Eastern Pennsylvania. The program is carried out in partnership with regional partners, including Appel Farm Arts & Music Center and Morris Arts. © 2018 NJ AIE. All Rights Reserved. Powered by Hopeworks ’N Camden.